cateritforward | I'm just a hack who likes to eat. One of my favorite things while traveling is hunting for great food. A chef friend told me Gonzales is jambalaya country and if you believe what the water tower says, Gonzales is the jambalaya capital of the world. I’m happy to announce that I have found some delicious jambalaya at The Jambalaya Shoppe. 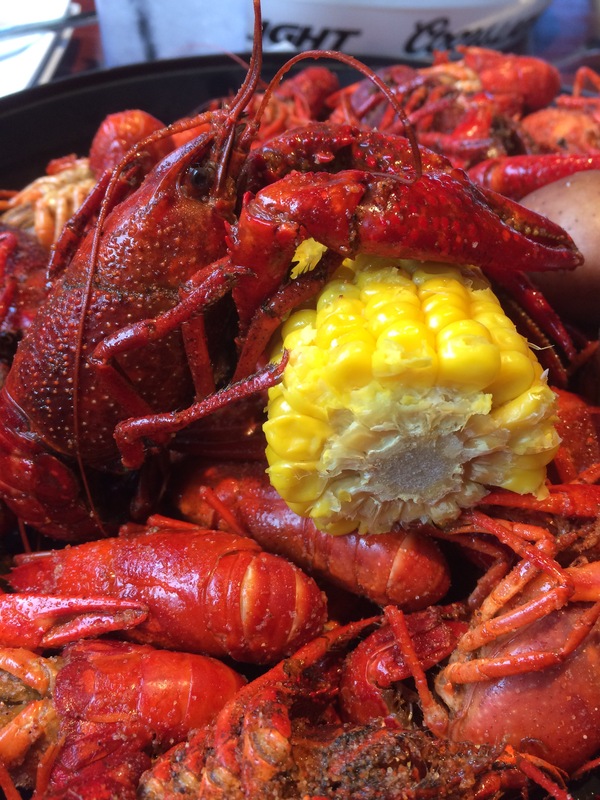 My research revealed this little gem and I was pretty certain that I was in for a treat as these restaurants are popping up around south Louisiana. 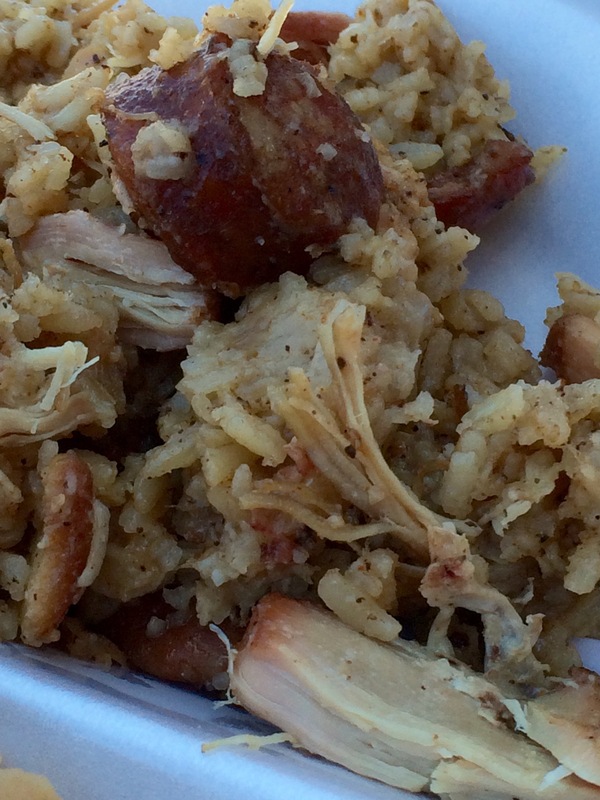 We opted for a bucket of chicken and sausage jambalaya and since the weather was nice, we ate at one of the two picnic tables in the parking lot. I do have to admit that this is the second restaurant in the region I have eaten at over the past couple of days that wasn’t spicy. 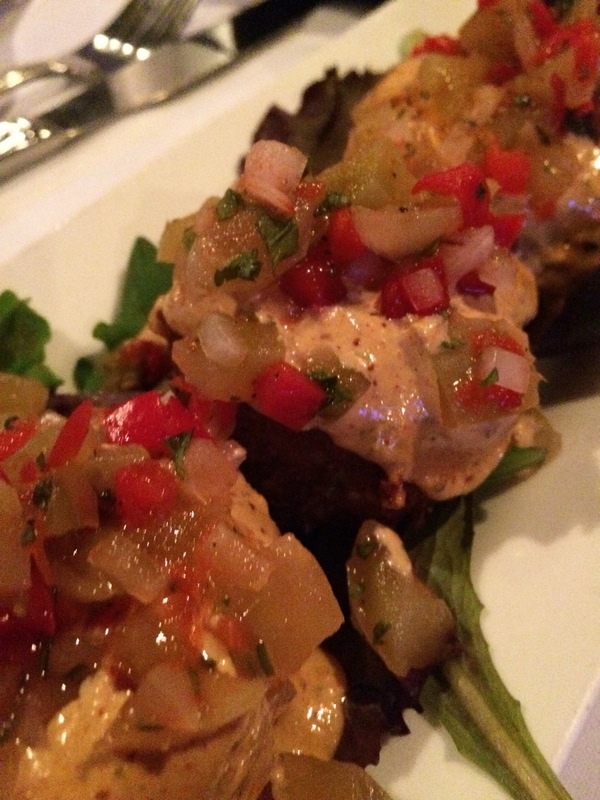 I love spicy food, and we don’t have many options for fire eating in Shreveport. I’ve always been told I have to go south for sinteringly hot cuisine–maybe this is reserved for New Orleans. Regardless, I happened upon a gem. 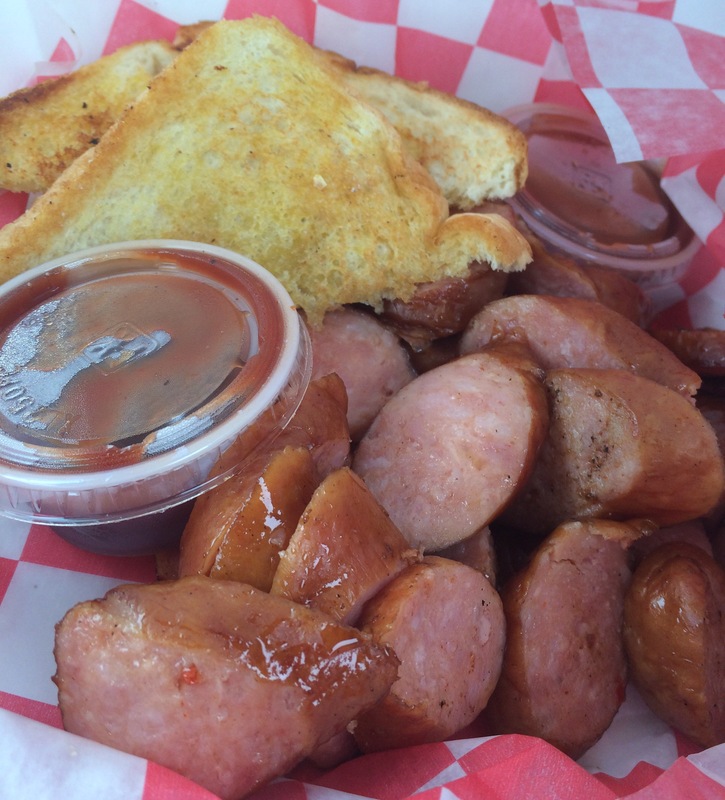 The original location is not much more than a shack–typically a good sign when you are searching for deliciousness. That standard holds true in this case. The sausage was delightfully scabbed, and the morsels of chicken were plenty. And the flavor profile? It held a subtle complexity that I will explore again this evening. I was ravenous at lunch and didn’t thoughtfully enjoy this delight, but I’ll savor it tonight. My only complaint is that it needed heat. Naturally, I added Tabasco, but I would have appreciated more heat. 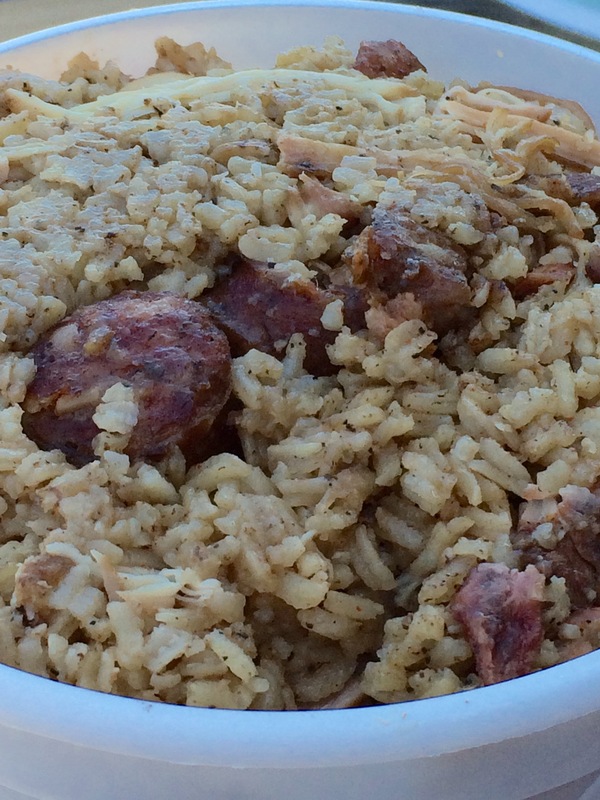 Make that two complaints–we do not have a Jambalaya Shoppe here in Shreveport. I hope my second complaint is properly addressed soon. I found myself in Dallas yesterday car shopping with my we teen year old. She and I share a love for good barbecue and when I told her were going to Dallas, she said, “For barbecue?” I said, “Yes, and we have to shop for a car.” I could have told her we were going to do anything I wanted, just so long as barbecue was in the plan. I opened up my trusty Yelp app and saw that 372 people reviewed this new addition to the barbecue world (the cashier told me that they opened a year and a half ago), and I figured that 372 people can’t be wrong about Ten 50 BBQ. Wrong they weren’t, but they weren’t quite right, either. I made sure to order the fatty brisket, untrimmed. 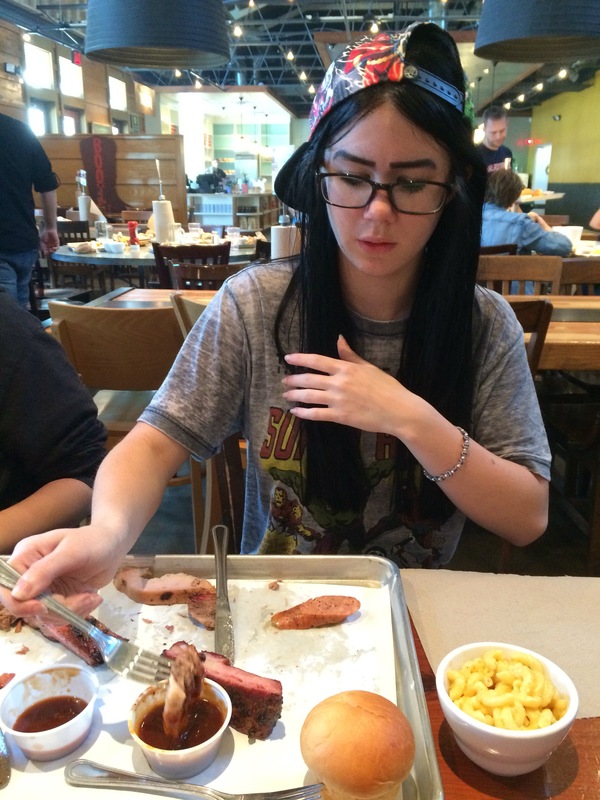 I also ordered the sausage, ribs, and turkey. I rarely order turkey, but we had my daughter’s friend with us and I think she can get a bit finicky. I also had to sample their pinto beans and potato salad. The meats were all prepared perfectly. The brisket was incredibly tender and the fat was rendered so perfectly that it dissolved the moment it hit your tongue. 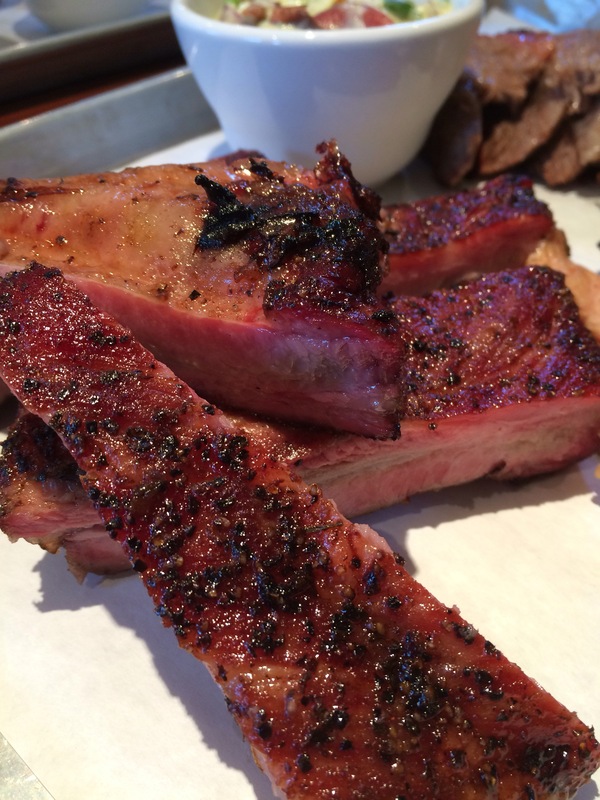 The St. Louis spare ribs had a beautiful smoke ring and pulled cleanly from the bone as you hit into them. The sausage with its vivid black pepper note was incredibly juicy. The turkey was decent and was moderately juicy. 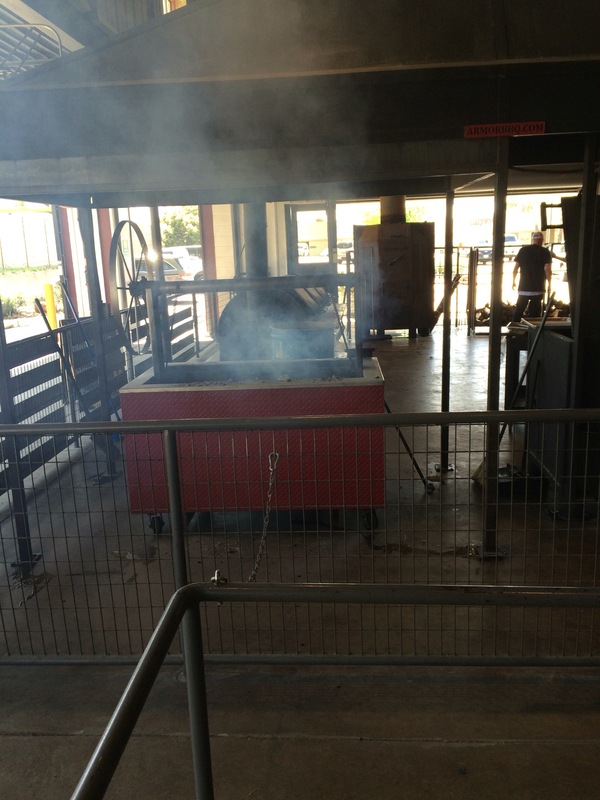 If you want smoked turkey that’ll impress, you want to take a jaunt to Jefferson, TX for Joseph’s Riverport Barbecue. I haven’t found any smoked turkey that compares. 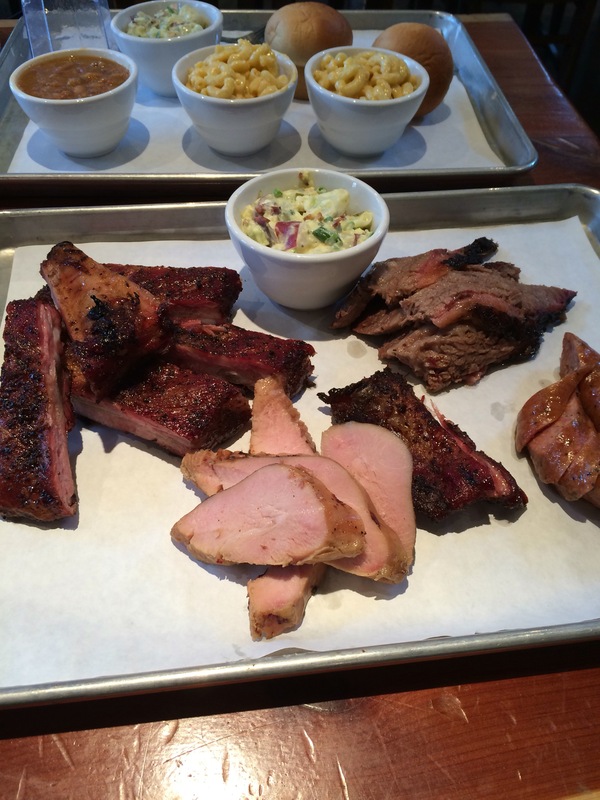 As I said, all of the meats were beautiful and prepared perfectly. It’s just that someone forgot to add flavor. (The sausage was the exception. I doubt the sausage is made in house. 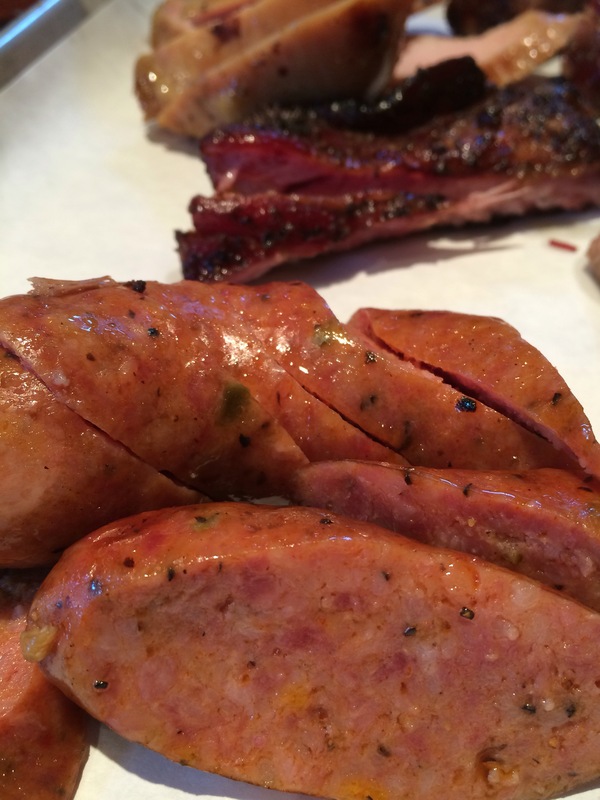 It reminded me of the sausage I had at Pecan Lodge. 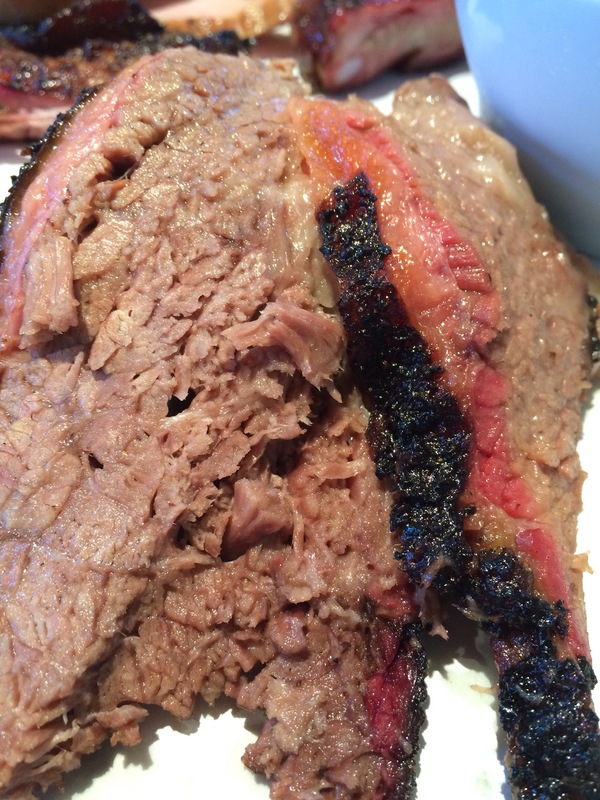 The brisket, though it looks as if it tastes otherworldly, is good but looks are deceptive. The crust looked great but had little flavor. I’d say the run needs work. Same for the ribs. They look great, but I only tasted an occasional hint of sweetness. Overall, they were pretty bland. As for the sides, the beans had a nice kick, but they weren’t terrific. As a matter of fact, they were so underwhelming, I’ll pass on them my next visit. I love beans, but they lacked something. The jalapeños were nice, but they weren’t a patch compared to the jalapeño beans at Hutchins BBQ in McKinney, TX. The potato salad was another story. It arrested my attention so much so that it completely eclipsed the meat. 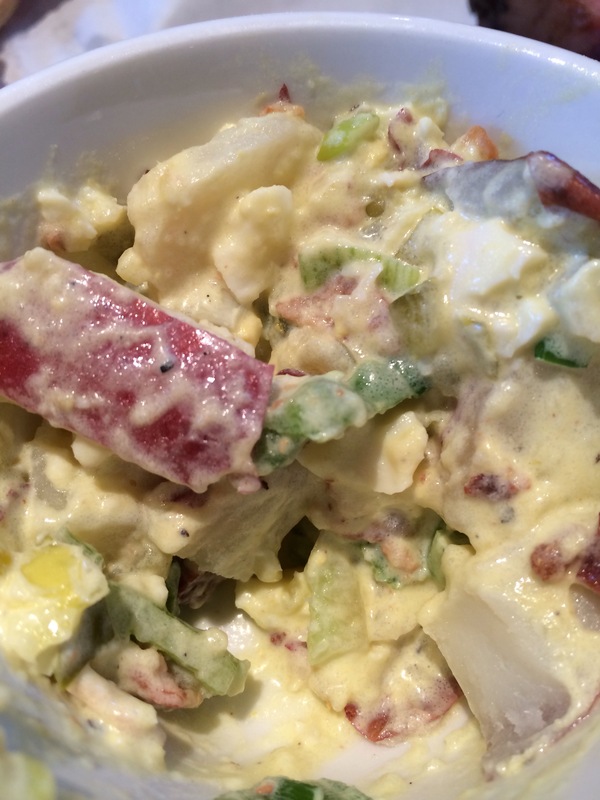 It had just the right tanginess–it was perfect with the red potatoes and green onions. I should have gotten two servings. As I looked at the clientele, my overall impression was that this restaurant was geared for old people and tourists. It seems that flavored are toned down for both types of customer. I had no idea how right I was until I read TMBBQ‘s review. Apparently, the restauranteur’s claim to fame is his creation of the Chili’s chain and that the plan is to do the same thing with brisket. I’m sure locations will spread like wildfire with its average flavors that are sure not to offend the palate of the uninitiated. Being in south Louisiana I was really expecting some fiery crawfish with out of this world flavor.I was hoping that Jane’s Seafood was going to scratch that itch. I ordered the extra spicy mudbugs to be sure. Sadly, they were only medium in heat intensity (they made my lips cherry red and I drank a whole pitcher of iced tea, but the residual flavor was lacking. The tail meat was pretty bland by itself. I don’t know if they aren’t soaking them, but that is my impression. Further, the potatoes and corn were not cooked in the boil–another hit at blandness. I also was expecting to see boiled onions, garlic, lemon, and maybe even orange, but I think they just use standard crab boil. Don’t get me wrong, they were tasty, but I expected much more my first time eating crawfish so far south. This place is popular and they have good food, but the crawfish ain’t a patch to Crawfish Hole #2 in Dixie Inn, LA. Nevertheless, it was a good day as I had a pile of crawfish. I was passing through town when I saw Williams BBQ. I immediately pulled over to see if I couldn’t find any information online. Nothing. I decided to brave this intrepid establishment as I have a hard time passing up BBQ. I wish I had. 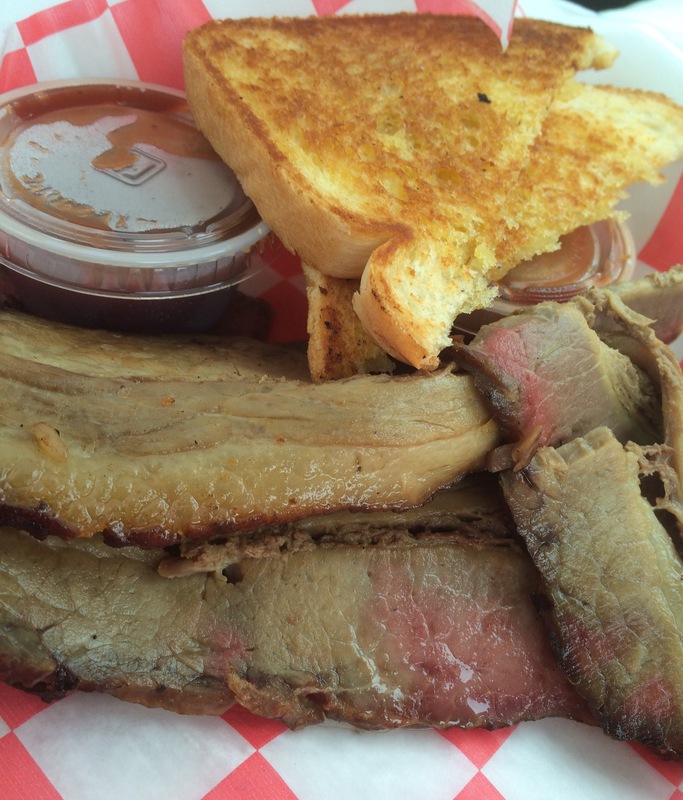 The owner promptly took my order–a half pound of sliced brisket and a half pound of sausage. As I was joyriding, I felt it best to eat on the road. First, the sausage. Though it was not bad, it was nothing special. Nothing but Eckrich or something similar. It was edible, though. After three or four bites, I was done with this mediocre offering. At least I was able to take it home to share. As for the brisket, no such luck. Never serve up Eckrich if you want to impress. The nauseatingly gray meat made me think that this was the stuff during wartime–a time where food is so scarce that people resort to eating their boots. At this moment I wish I was eating pilfered boot leather. Though the meat was sliced paper thin, it still was as tough as the aforementioned footwear. The fat wasn’t rendered which left an uneasy feeling not unlike the the unveiling of Ed Gein’s horrorfest. Never before have I encountered the stench of death on a plate. As I brought up a piece to my mouth, my nose caught something out of place. I couldn’t quite place the subtle sick fragrance of decomposition. When I took my first (and only) bite, I knew immediately the nightmare that enveloped my taste buds–it was sour. It wasn’t full-on maggoty meat, but was a subdued flavor of rottenness. I spit it out of the truck and this little delight found its way into the trash can. The owner said they have been open for three weeks. I predict they will be out of business by Thursday. If you want to read about real mediocre barbecue that won’t put you in the morgue, try this, this, and this. I know a guy who has some really wonky ideas regarding religion and the afterlife. In comparison to every other post modern, I suppose his ideas aren’t all that wonky–in fact, they are consistent with just about every other new age seeker. They are persistent and may be sincerely held beliefs, but they are wrong. His early years were influence by Catholicism, but I suspect that came from his grandparents and I don’t know how devout he may have been. By looking at his other endeavors he has encountered over the years, I have to assume that had no lasting impact, save for the fact that he partly attributes his “falling away” from these “oppressive years”. If he would read his Bible, he would see that he never was a convert as the act of backsliding is evidence that, to quote Todd Friel and Ray Comfort, “he never slid forward in the first place.” Nonetheless, his rejection of Christ led him to dabble in silliness such as his opinion that all religion is invalid because some practices “such as sun worship” are ridiculous. I believe that is the Fallacy of Division. This guy not only perpetuates fallacies, but vehemently defends his logical errors. It’s easier to reject the truth rather than face it. Submission to God requires us to deny ourselves. (Luke 9:23) That symbolic death to self runs counter to what is taught in the world. This guy I know wants to be a big man with accolades. He wants to be puffed up by others. He wants people to tell him that he is brilliant when he parrots new age heresy that all religions and all manner of unbelief lead to God. This guy is a cosmopolitan man of the world and expends great effort to fool himself with his self-styled intellectual grandiosity. He is drunk on vanity. Just a cursory perusal of Ecclesiastes would expose his folly. Everything apart from Christ is meaningless and this person’s entire existence is nothing but chasing after the wind. The widespread flooding brought us to Monroe, LA. I’ve passed through this city a million times, but when I came to serve with Mercy Chefs, I came prepared to stay a couple of days. 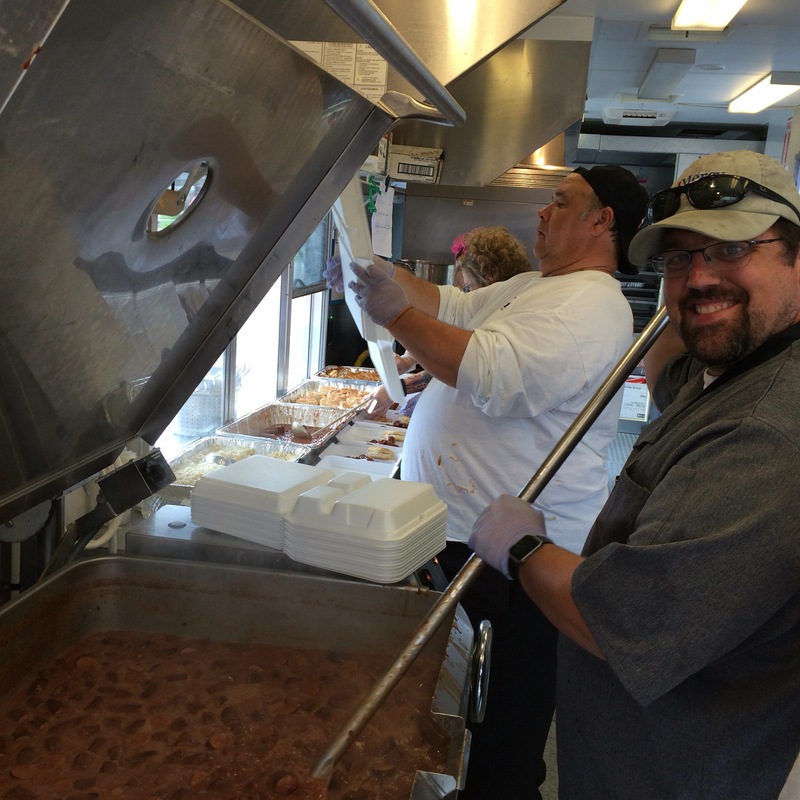 We typically spend fifteen hours a day preparing restaurant quality meals in a mobile kitchen. It’s hot and we continually have to watch out for hazards. It’s only a small price we pay so that we can serve those whose lives have been disrupted by disaster. 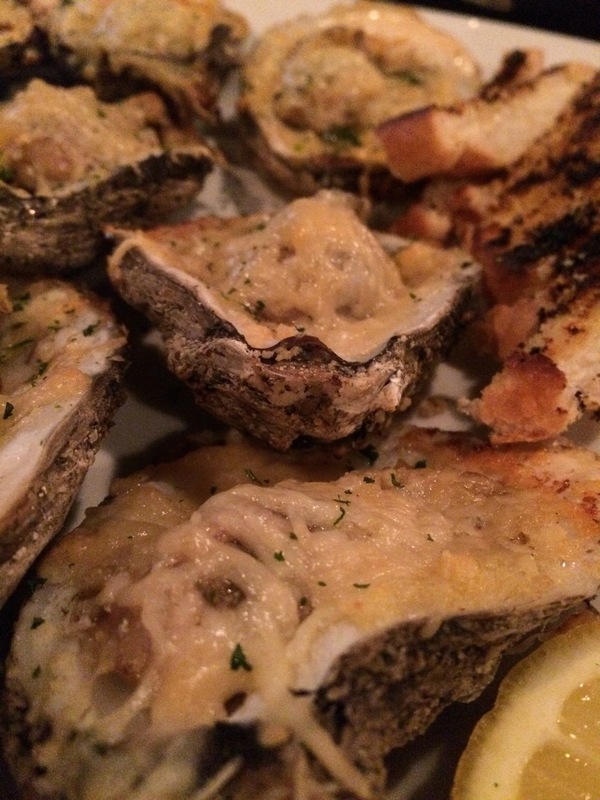 Louisiana gulf oysters with garlic butter and parmesan. He brought out all sorts of food for us to sample from the grilled oysters and crab cakes, to the sage wraps which were chunks of filet stuffed with cheese and jalapeño and wrapped in bacon. Absolutely unbelievable. Another high point was the andouille and duck gumbo. Chef Blake told us how intricately it was prepared and all of that effort in preparing it was not in vain. It was incredible. Jumbo lump crab cakes with green tomato relish and red remoulade. Finally, we fell upon the main course. A couple of us fawned over the short ribs, another had the blackened snapper, and I had the soft shell crab with alligator sauce piquant. Everything was great but I have to say the alligator stew was “on point” as one of my fellow chefs kept saying throughout the meal. Next time I’m in Monroe I may have to enjoy another unforgettable meal. Somewhere on the order of twenty four inches of rain fell on the great state of Louisiana last week and thousands were affected. I can’t even begin to imagine how many people lost everything in the flooding. Here we are nine days later and the water has finally receded from the only road to my house. We had to get creative to get to and from home because of this. I only had some minor flooding in the living room and I think we cut the pad out in time to rescue the carpet. My problems pale in comparison to those we are serving this week in Monroe, LA. Chef John Stout smiling as he stirs red beans and Chef Gary LeBlanc assembling meals. 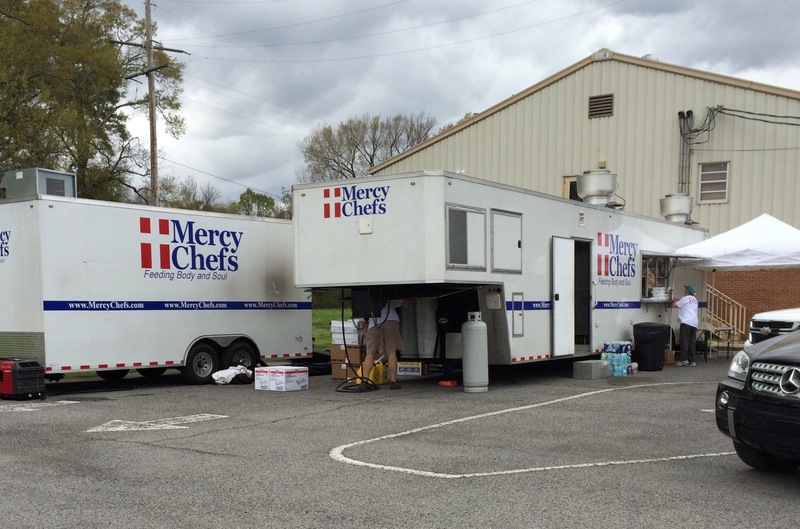 As a Mercy Chef, I serve alongside many talented chefs to provide restaurant quality food to victims, volunteers, and first responders. Our numbers have been increasing daily. As I headed home today, I was advised we prepared 1000 meals at lunchtime. The hours are long and the work is strenuous–over two and a half days I worked nearly 40 hours. 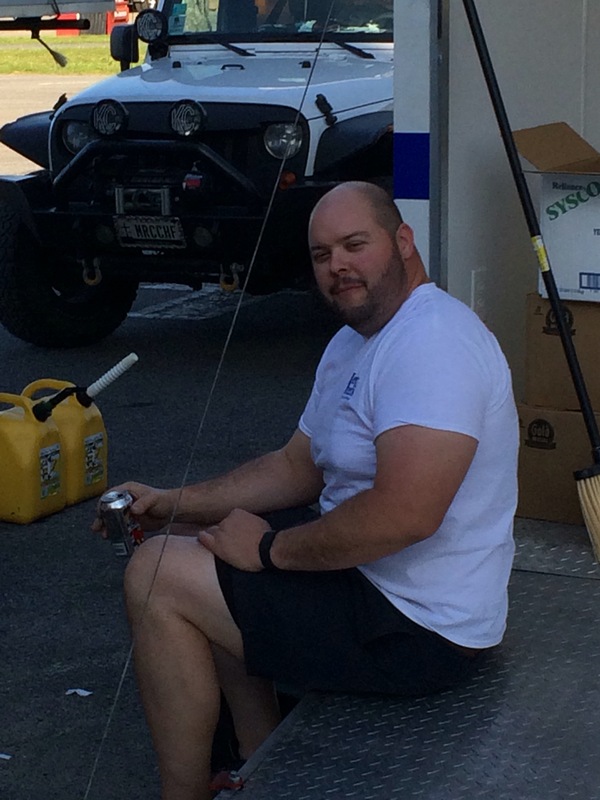 Chef Buddy raking a much needed break. As I lay in bed reflecting on the past few days my body, my swollen hands, aching back, and angry feet remind me that I’m going to pay for it. But I’m in my bed. I’m not cramped in a Motel 6 relying on the kindness of strangers to meet my basic needs. I’m in my warm home listening to my sixteen year old daughter practice her piccolo solo. My friends are still serving in Monroe as the need is great. We don’t do anything special. In comparison to other disaster relief ministries one might think we don’t do much at all. And they would be right. We provide a meal. It’s intransient, yet a hot meal brings comfort in crisis. 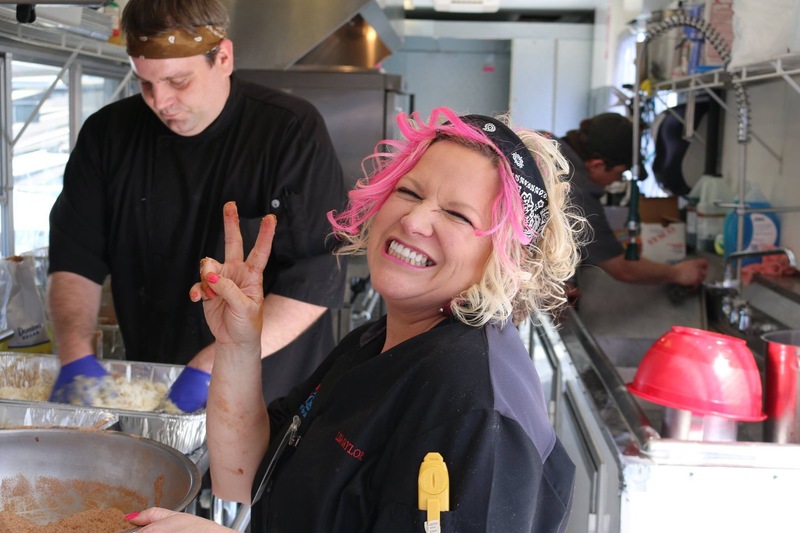 Chef Lisa peacing out while Chef Blake prepares apple Brown Betty. I’m the joker washing dishes. M3 along with its companion cooler trailer. That’s what Mercy Chefs does. I always get excited to eat burgers. Not all burgers, though. I’ll wrestle with a couple of McDoubles now and then, but when I have an opportunity to enjoy something remarkable, I’ll sometimes feel those butterflies of excitement in the pit of my belly. Or it might be a McDouble returning with its greasy wrath. I brought my daughter Zoe’ on a lunch date and we ventured into Grub Burger Bar. It’s only been here about a month and I’ve heard mixed reviews. It was time I brought my eleven year old burger expert to investigate. I knew I was in for a treat when I saw a guy making the rolls from scratch, (These fresh rolls are better than Mooyah‘s), but I still couldn’t shake the mediocre review the the lady who insisted on talking as she cut my hair a couple of weeks ago. Then again, hairdressers don’t have palates. They have scissors. Zoe’ sampling a fry before she goes in for the kill. This monstrosity is called the OMG. I prefer to call it the angry burger smothered in fries and chili. The meat was fantastically juicy and nicely seasoned–a stark contrast to the over salted shoe leather I consumed the last time I ate at Twisted Root. I’m not saying Twisted Root is trash, I’m saying that the last time I was there it was nightmarishly mediocre that I’m not sure I can return to take a risk on returning because their prices are already sky high. All I’m saying is that if I’m going to spend my kid’s college money on a burger, it better be good. All in all, it was great and I know that because my redheaded burger critic loved it. She just wished that it could have come with Five Guys’ fries. I was downtown this afternoon looking for the courthouse as I had jury duty. I was actually looking forward to the experience even though it upended my daily circus of picking kids up at three different schools. Fortunately, my father-in-law was able to step in so I could fulfill my civic duty. I was waiting at the crosswalk as I was running uncharacteristically late–I had twelve minutes to get inside, through the metal detector, and downstairs to my appointed room. From nowhere I heard someone yell my name. I scanned the faces on the street and saw one I recognized–except the street made it more grizzled and it was buried under a matted beard. It was Graham, a man I met while working at the rescue mission. When he was staying at the mission, he always hunted me down to talk. Sometimes I was really busy in the kitchen, but I always tried to spend a few minutes with him when he wanted to chat. This time I didn’t have time for him. I felt terrible leaving him but I was due in court. I sat down with two minutes to spare with Graham heavy on my mind. I wondered if I could track him down afterward. I watched the clock wondering how many hours I would be delayed and the impossibility of tracking a man down in the streets. A woman walks in and calls roll. Then, the judge walks in to tell us that all of his cases had been resolved this morning and that we are all released. That’s it. Any other day I would have felt cheated, but I was elated as I hurried out to find my friend. I scanned the streets and Graham wasn’t there. I was determined to find him, so I started walking. I walked three or four blocks and just as I was about to give up, I spotted him across the street. I’m sure I looked foolish yelling and flailing my arms to capture his attention, but I was glad to see him. He was thin. I asked him if he had eaten and he said no. I don’t know if he hasn’t eaten since breakfast or last Tuesday, but I invited him to eat lunch at Subway nearby. He talked about everything. He talked about his old lady and that he is going to be a dad soon. He said that he has been watching people to see how they treat their kids as he wants to be the best father around. He told me about how a marine sneaked into his camp and stole his wallet. He told me about his gun and his knife as big as a broadsword he keeps at his camp for protection. I certainly don’t believe that there are covert operations at his camp, but I do believe that he has a pregnant “old lady.” I also believe him when he describes how he is invisible on the street. He hates the emptiness he feels when people look away. That’s when I realized that one of the most important things I could have given him–far more important than cash or food was dignity. I don’t know what it feels like to be ignored by society. I’ve never been treated like a stray animal and I’ve never had anyone cross the street to avoid the discomfort of being near me. But he has. I believe providence is what brought me downtown. I also learned how fleeting opportunities can be. Let’s not squander them and please pray for Graham.